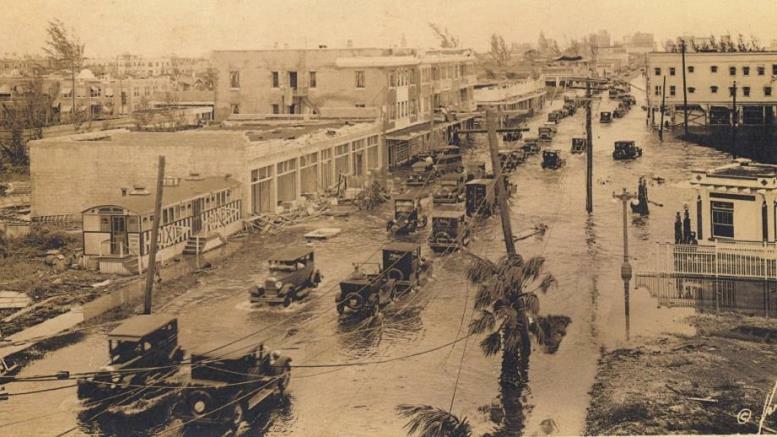 Flooded Street in Miami during 1926 Hurricane. This episode is the first in a two-part series on the history of hurricanes in South Florida. Life in the tropics means having to endure dangerous storm. There have been many perilous and costly hurricanes since this turn of the last century. The two-part hurricane series will focus on several of the more prominent storms between 1900 and 2005. The 1906 and 1909 hurricanes had their greatest impact in the Florida Keys. It was during this time that Henry Flagler was extending his Oversea Railway to Key West, and many of the lives lost during these storms were workers on this project. The 1926 Hurricane is still remembered and discussed today. It was the “final blow” to the great real estate boom of the 1920s. The storm’s path went through the heart of Miami Beach and downtown Miami. The 1928 Hurricane had its biggest impact in the Lake Okeechobee area and caused significant flooding that resulted in a death toll of over 1800 people. The Labor Day storm of 1935 had sustained winds of over two hundred miles per hour. It led to the end of the FEC Oversea Railway and killed many World War I veterans working on the Oversea Highway project. The post-WWII hurricanes were notable for heavy rain and flooding. It was in the mid-1940s when Hurricanes began to get names. Hurricane George and King were two storms during this time that had far reaching implications. Part-Two of this hurricane series will focus on the storms from 1950 through 2005. The second episode will detail Hurricane Andrew and the very active 2005 hurricane season. If you are a member, you can access the video by clicking the ‘View the Video’ button below. If you are not logged into the site, you will need to do so in order to get access to the video page. If you are not a member, you can easily sign-up for an annual membership by clicking on the ‘Join today’ button below.